Gold deposits in Vermont are quite similar to New Hampshire and Maine, in that overall production of the metal has been relatively low. While there was certainly some initial excitement soon after the initial discovery of gold here, the general consensus was that the gravels did not pay well enough to work profitably. Of course this didn’t stop a few folks from trying, and several areas in Vermont have been prospected quite extensively over the years. By far, the most interesting area for a gold prospector is in the general areas around Plymouth and Bridgewater, where lode deposits have supplies gold to many of the nearby waters in the area. An interesting fact about gold from this area is that it assays as some of the purist natural gold in the world, near 23.5 karats. This is higher than nearly all of the famous gold districts in the United States. Most gold nuggets assay in the range of 18k to 20k. As with most of New England, gold nuggets are few and far between. The vast majority of gold is fine placer gold dust. Finding areas that have flakes and nuggets can be quite difficult, although there are prospectors who successfully find larger gold here. Research and hard work are necessary if you want to be successful as a prospector here. A very popular place to search for gold is in the Ottauquechee River, and one of the richest places on the river is near the town of Bridgewater, although gold can be found all throughout the river. Broad Brook flows into the Ottauquechee River near Bridgewater, and is also an excellent place to look for gold. From its mouth to the area around Five Corners is a great place to find some gold. The original discovery of gold in this area caused quite a bit of excitement when the locals in the area first found it. Like most gold occurrences in the Northeast, they soon found that the quantities of gold were quite limited and it paid better to farm the land around them than it was to prospect for gold in the brook. Of course not everyone moved on, and there have been plenty of attempts made to mine this area profitably. History suggests that although have certainly been many ounces of gold recovered from this area, the cost of recovery was never enough to justify large-scale mining operations. Few gold nuggets were found. Primarily gold is found in small deposits of flour textured gold particles. The White River is a major tributary to the Connecticut River located in Central Vermont. The stretch along Highway 107 between Gaysville and Bethel is a known gold producer. The creeks around Shady Rill are known to contain small amounts of placer gold. It is located just west of the Wrightsville Dam; check out Herrick Brook, Martins Brook, and Patterson Brook. This area is just a few miles north of Montpelier. A few miles north of Wrightsville Dam is the small town of Worcester. If you take the road to the west out of town you will be following Minister Brook. Its headwaters start in the Putnam State Forest and flows southeast toward the town of Worcester. Fine gold can be found in this brook. Rock River flows into the West River near the town of Williamsville. Gold can be found all throughout the river around Brookside, South Newfane, and Williamsville. West River also has some gold in it. A popular camping area is found at Jamaica State Park in the town of Jamaica on the West River. Gold can be found in many parts of the Black River, a major tributary to the Connecticut River in Windsor County. The area around the town of Ludlow is known to be productive. The Mad River is known to contain very fine gold. The best known area to search is around the town of Warren, but there is likely to be fine gold deposits throughout the river system. Another tributary to Lake Champlain is the Missisquoi River. Anywhere around the towns of Lowell or Troy will produce gold. Many of the waters around the town of Stowe contain gold. Gold Brook is appropriately named. The headwaters come off of Hogback Mountain and flow into the Little River just downstream of Stowe. Gold is also found in the Little River itself from the towns of Stowe down to its confluence with the Winooski River. 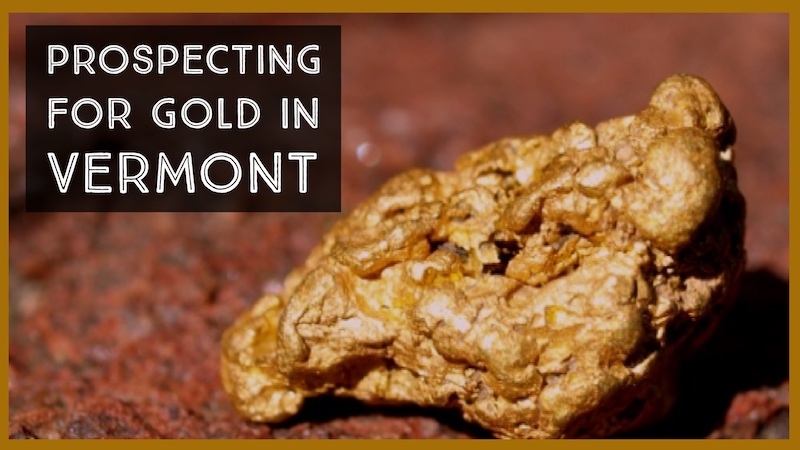 Vermont has lots of good opportunities for gold prospectors throughout the state, but the regulations in place are a bit more restrictive than in neighboring states. Motorized equipment such as suction dredges and highbankers are not currently allowed in Vermont. Check with the Vermont Department of Environmental Conservation to get the most up to date regulations. As always be sure to gain permission from landowners prior to any prospecting on private land, and treat all areas with respect. Getting permission in writing is always a good idea.